Charles E. Spencer was born in England in 1869. By 1901, he was living in Southampton and working as a builder and jointer. At the age of 37, he immigrated to Canada and filed on a homestead in Moose Jaw. By 1909 he was living in Edmonton and became a partner in the Argonaut Company, the development company that founded the Grande Prairie townsite. As a partner in the Argonauts, Mr. Spencer was one of Grande Prairie’s first real estate agents. He bought and sold land, and rented out a series of “cottages” and an office block. He also formed a partnership with Neil Campbell, another Argonaut, and re-entered the building trade. Charles Spencer designed and/or built many of Grande Prairie’s early public buildings: the first school in 1915; the large brick Montrose School in 1917; the Grande Prairie Hotel in 1917; the Spencer Block in 1919; the first Town Hall, which also included the Fire Hall, in 1920; the new Grande Prairie High School in 1929; and the Donald Hotel in 1937. 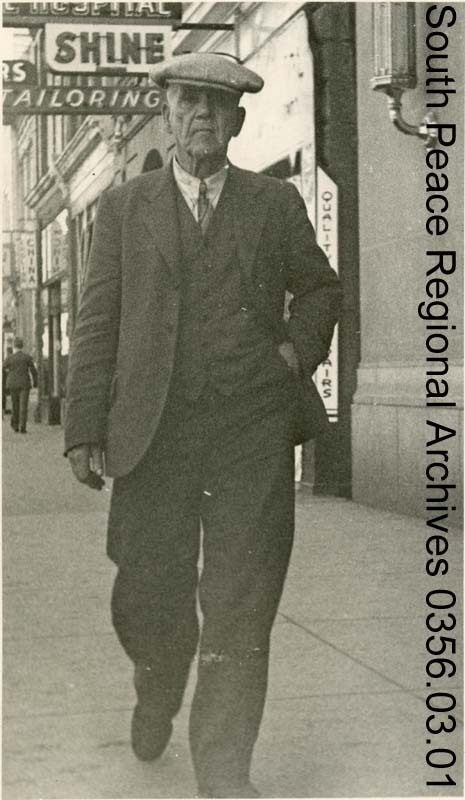 When the building trade slowed during the 1930s, he traveled around the south Peace building stockyards and loading platforms for the Grande Prairie Cooperative Livestock Association. It was out of the Spencer Block that Mr. Spencer operated “Prairie City Agency”, which sold all lines of fire insurance. An earlier business venture was the Grande Prairie Electric Light Co., which he encouraged the ratepayers of the town to establish in 1917. They formed a company and sold shares, providing electrical service to the town until Canadian Utilities took over the franchise in 1929. Besides being a partner in the Argonaut Company and a builder, Charles pursued a number of other interests. As early as 1917, he opened a lending library in the Donald Hotel, cooperating with the Extension Department at the University of Alberta to provide the best possible reading material. Although this library was not in operation long, Spencer continued to promote the need for a public library and was instrumental in forming the first Library Board, of which he was the first chair. He also continued to build his own collection, which was reputed to be one of the most complete in the north. In 1952 he donated his own private collection of 2500 books to the public library. Mr. Spencer was also a founding member of the Board of Trade, member of the Hospital Board, Chairman and/or Secretary-Treasurer of the Grande Prairie School District 2357, Justice of the Peace, Commissioner of the Juvenile Court, and town councilor. Mr. Spencer died on February 18, 1952, at the Grande Prairie Municipal Hospital after a lengthy illness. As a mark of respect, all stores in the town closed for his funeral. The Spencer Block was purchased by the Army and Navy Department Store out of Edmonton, and the building razed. In 1955, Macleods was built on the site.